Information on the proposal as submitted by the developer can be found on the BRA’s website HERE. 19 residential condominium units in 2 buildings (6 units/13 units). Unit mix is 2 1BRs, 15 2BRs, 2 3BRs. 19 off-street parking spaces (1 per unit). Bicycle storage for 34 bicycles. $2,000 car-sharing service credit to each unit buyer. Generally speaking, this is a project that fits within WalkUP Roslindale’s principles and is likely to gain our support. The location is adjacent to the square, and so walkable to its services, restaurants, shops, and transit options, and the design and program appear interested in making use of that walkability. To get the most out of this project as a neighborhood, we will want to focus much of our attention on the quality of the urban design here so that we end up with something much closer to the substation redevelopment as opposed to, for example, the redevelopment of the former Roslindale Pub site. 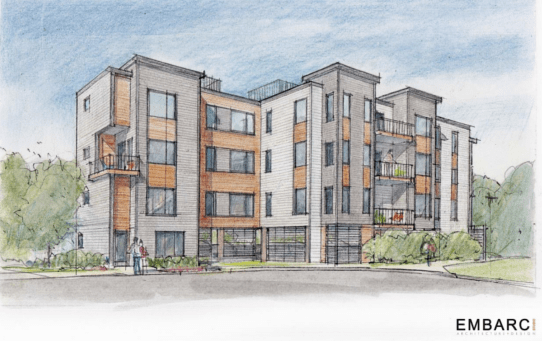 The initial renderings suggest that this will be more like the substation, even if it is a bit of a departure from typical residential architecture in the neighborhood. According to the application, the project will require zoning relief (in this case, variances) because the site is zoned 2F-5000, a subdistrict previously discussed at this blog. Given the project’s size, it will also be subject to the city’s inclusionary development policy, also previously discussed here. That means that at a minimum 13% of the units will need to be affordable under the policy’s definition. WUR is already on record through our principles that we think this percentage is low given the scope of the need and it further doesn’t address the broader workforce housing challenge that has occupied so much of the Walsh administration’s attention and bubbled up just a couple of days ago in a slightly different context dealing with the city’s housing and jobs linkage fees. This is an issue that will need to be on the table. The developer’s decision to include bicycle parking and car-sharing credits shows a willingness to engage on encouraging active transportation in our neighborhood. To WUR, this presents the opportunity to work constructively and proactively on promoting walking, bicycling, and transit infrastructure, very much along the lines of the City’s recently released draft vision for GoBoston 2030, especially the “health” section. New development that smartly leverages our neighborhood’s existing active transportation assets should be thinking about ways to concretely support their improvement and expansion. The 1-to-1 off-street parking ratio will be a topic of discussion and deliberation. The multiple intersecting issues that are bound up in parking were identified as needing thoughtful consideration in an early post here. Clearly, there are different sides to this issue and spillover effects on generally available on-street parking from households that own more cars than they have off-street parking spaces to put them in can have impacts. On the other hand, simply imposing a higher rate of off-street parking has multiple impacts of its own, including increasing motor vehicle traffic, taking up valuable space that could be devoted to other, more productive uses, and driving up the cost of housing to provide an “amenity” that many residents may not want. These are just a few of the considerations about parking that I’m sure will be voiced through this process. Finally, a note on process: This will be a public community meeting required as a result of the developer’s Small Project Review application. There may be more than one such meeting for this process and there will also be an accompanying written comment period that the BRA project manager will identify at the meeting. Conclusion of this BRA process with a BRA Board vote will then be followed by a process with the Board of Appeal for the variances that would almost certainly include a further public community meeting and then a hearing before the Board. In other words, there will be multiple points at which to plug into this process, be heard, and be counted. East Roslindale Urban Wild Bicycle Tour Tomorrow (Sunday 10/18/15) at 8am!